Donald Stuart, "Diana Krall." 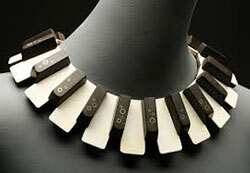 Piano keys, gold inlays, sterling silver, walnut.Homage is a collection of 40 framed neck-pieces created as a celebration and tribute to Canadian women, past and present. The curator, Susan Benson RCA, sketched portraits of each of the women to accompany the pieces which, along with short biographies, add so much to the educational aspect of the exhibition. As a contemporary jewelery artist, Donald Stuart has used the familiar form of the necklace to explore history from a fresh perspective.